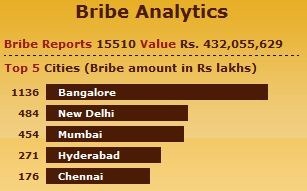 According to statistics released by iPaidabribe.com, Bangalore comes out on top as the most bribed city in India. This is quite a surprising statistic, as one may have thought it would be either of the two metros, Delhi or Mumbai, who would witness maximum amount of corruption! 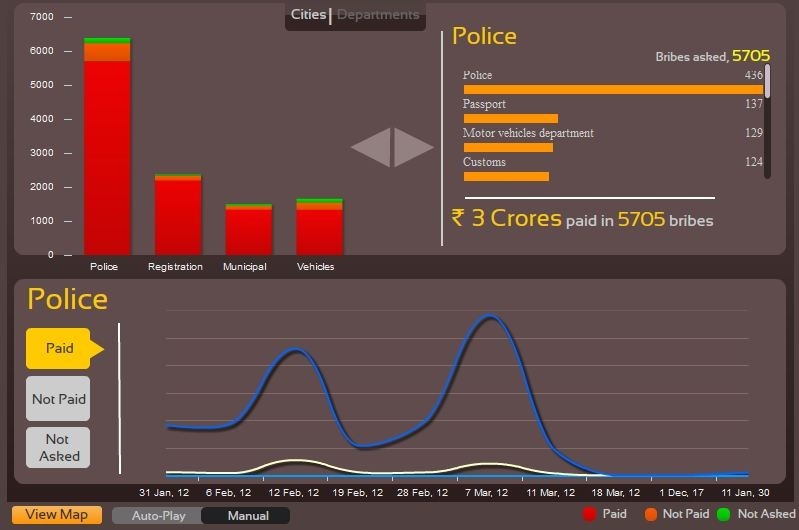 iPaidabribe.com, is an initiative by Janagraha, encourages Indians to disclose the bribes they pay to anyone. One of the reasons why the finding may be skewed is because it is prepared based on the what people from various cities have disclosed on the website. Bangalore being an IT hub, maximum number of people have made entries from that city and hence the number 1 position. Bangaloreans are at the forefront when it comes to paying bribe to evade a challan for illegal parking; On an average, Bangaloreans pay Rs 378 as bribe to evade an illegal parking ticket. Delhi came second with Rs 350. Although, the city statistic may be skewed, the report has some interesting finding about the Government departments that lead in taking bribes – Police is by far the most bribed department. Over Rs. 3 Crore of bribes were accepted by Police officials in 5705 instances. Police department was followed by registrations, Municipal Corporations & Vehicle as the next 3 departments who accepted maximum bribes. You can check out the entire interactive report by ipadabribe.com . Also, if you have paid a bribe, do not hesitate to send a sms or go to their website to disclose the same. Here is a question to readers, which city do you think is the most bribed city in India – My vote would go to Delhi, what about you? Come on! This statistic reflects Bangalore as #1 only because Bangalore is way more tech savvy and citizens would actually login and report a bribe. It is really surprising and shocking too but it can possible because Bangalore is a business hub and it has more liquid flowing in the market and obviously more the money more the corruption !